"Single White Female" introduced audiences to the psycho roommate, "Pacific Heights" introduced us to the psycho tenant, "The Hand that Rocks the Cradle" dramatized the problems arising from the psycho nanny, "The Good Son" highlighted life with a psycho stepbrother, and now, with this week's new release, "The Glass House", comes a story about psycho guardians. Leelee Sobieski ("Eyes Wide Shut") plays Ruby Baker, a high schooler living it large in the Valley with her loving parents (Michael O'Keefe of "The Pledge" and Rita Wilson of "Runaway Bride"), a bratty brother named Rhett (Trevor Morgan of "Jurassic Park III"), and some wild and crazy girlfriends who know how to have a good time. Unfortunately, this all comes crashing down after her parents are killed in a car crash, leaving Ruby and her brother in the care of Terry and Erin Glass (Stellan Skarsgard of "Dancer in the Dark", Diane Lane of "Hardball"), an affluent couple who used to be their next-door neighbors. The Glasses do their best to make Ruby and Rhett feel at home in their immense Malibu beachfront home, showering them with new clothes, video games, and gourmet food. And while Rhett quickly settles in to the lavish new digs, Ruby is not quite convinced that their new guardians are who they appear to be. Terry, the proprietor of a luxury car rental business, is apparently deeply in debt with some sinister figures, while taking an unhealthy interest in Ruby by constantly leering at her. Meanwhile, in addition to listening in on Ruby's telephone conversations, Erin seems to be struggling with a nasty drug habit. Sensing a hidden agenda at work, Ruby desperately tries to alert others to the strange goings on at the Glass house, including her family's trust lawyer (Bruce Dern of "All the Pretty Horses") and a well-intentioned social worker (Kim Webster). Unfortunately, no one believes Ruby, who chalk up her paranoia to her recent loss and a rebellious 'attitude'. Thus, it is up to Ruby to turn the tables on the Glasses, and expose them for what they truly are. For the first half, "The Glass House" is an above average thriller, as Ruby uncovers a number of startling revelations about her adopted family, while finding herself increasingly threatened by their erratic behavior. 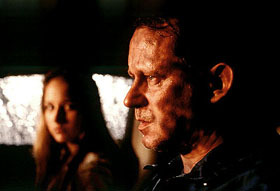 Director Daniel Sackheim (a veteran of TV whose credits include "The X-Files" and "NYPD Blue") and his cinematographer Alar Kivilo ("A Simple Plan") make good use of the ominous shadows and lighting of the prison-like glass and concrete house, while Skarsgard is appropriately volatile and menacing. However, as the sinister plot of the Glasses is gradually revealed, "The Glass House" disappointingly goes down the direction of a 'mad slasher' movie, with Ruby and Rhett trapped in an empty house with a guardian gone mad, echoing the film's opening scene which has Ruby and her friends watching a lame teen horror flick. Thankfully, scribe Wesley Strick ("The Saint") ensures that Ruby still has a few tricks up her sleeve, avoiding yet another one of those overused struggle-that-ends-with-the-killer-falling-on-their-own-knife endings. Despite the disappointing second half, "The Glass House" still remains watchable throughout thanks to Sobieski's convincing performance. Reminiscent of a young Helen Hunt ("What Women Want"), this versatile young actress carries the film with aplomb, credibly conveying the confusion and anxiety of her character-- while some of the plot points may strain the believability of the story, Sobieski's reactions to them remain genuine. As for the rest of the cast, Morgan is passable as Ruby's easily-influenced younger brother, Dern is sufficiently oily as a lawyer who may or may not be trusted, while Lane serves up a cold contrast to her role in this week's other opener, "Hardball". It may not necessarily be a first-rate thriller, but this "Glass" is thankfully half-full. Helped in large part to the ability of actress Leelee Sobieski to hold the audience's attention with her surprisingly engaging performance, "The Glass House" is a modest thriller that more-or-less does what it intends to do.